Now this is an APPLE PIE. My MIL loves apple pie, so I made one for the Memorial Day BBQ we had at their place. I mean, nothing’s more American than apple pie, right? Ha. I also made a chocolate pie, too, because, well, gluttony. This is a relatively easy pie to bake with the exception of the caramel sauce and the lattice crust topping. Neither of these two things are all that difficult, though. Sally’s Baking Addiction does a great job of explaining how to make the caramel sauce over at her site, making what can be quite challenging rather simple. 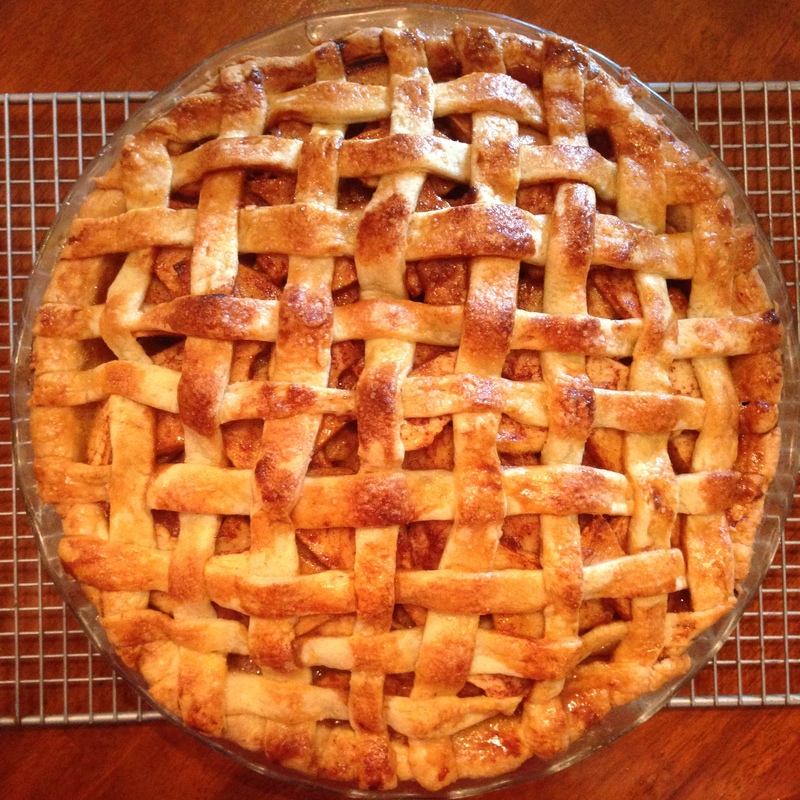 With the time it took for me to hone my lattice skills, I ran out of time cooling time. I had to serve the pie still warm, which resulted in some messy slices. Once the pie had cooled properly, though, I was able to get some prettier-looking slices, so I will have to remember that next time. A lesson from my dad that I’ve grown to prefer is to double the spices in most recipes because many recipes aren’t spicy enough. I doubled the spices here, and I thought the pie was excellent, so I’ll probably keep the spices in this quantity. I also served this pie with a homemade whipped cream (the recipe is included with the chocolate pie). For the caramel: Heat sugar in a medium saucepan over medium heat, stirring constantly. Once sugar is completely melted, add the butter and stir until the butter is completely melted. Slowly drizzle in the heavy cream while continuing to stir. Allow this mixture to boil for 1 minute untouched, then remove from heat and add salt. For the apple filling: Add lemon juice and zest to a very large bowl. Add apples and toss gently. In a small bowl, combine flour, spices, and sugar. Pour mixture over the apples, tossing to combine. For the assembly: Roll out one of the pie crusts (keep the other in the refrigerator) and place the dough into a 9″ deep dish pie plate (2-2.5″ works), trimming any overhang. Fill the pie crust with the apples, layering the apples as closely together as possible. Drizzle 1/2 cup of caramel sauce over the apples, reserving the remainder for topping. Remove the other pie crust and roll the dough out. Using a pizza cutter, cut 16 1/2″ wide strips and prepare the lattice crust. 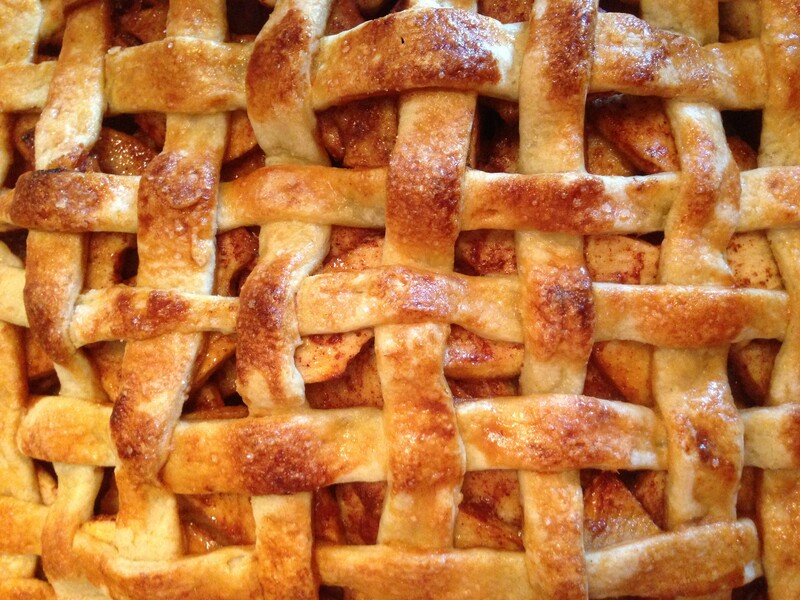 Trim any overhang and clamp down the edges of the lattice into the pie crust. Brush the lattice top with the beaten egg and sprinkle it with coarse sugar. Place pie onto a baking sheet (to catch any spillover), and bake for 20 minutes. Reduce temperature to 375 degrees, and bake for another 40-50 minutes or until the caramel begins to bubble up. Allow the pie to cool completely (more than 4 hours) before serving.